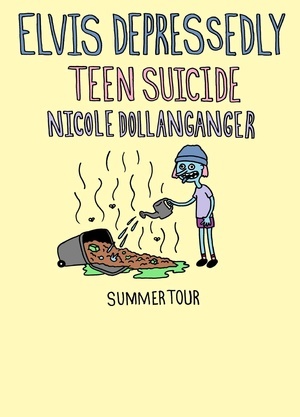 This Wednesday, August 31st Party Store Productions will be bringing Elvis Depressedly, Teen Suicide, and Nicole Dollanganger to the stage at El Club. Elvis Depressedly recently released their fourth album Holo Pleasures, you can check that out here. Tickets to get into the show are only $12 at the door and they can be purchased here. We also have one pair of tickets to give away to the show courtesy of PSP. If you would like to enter to win a pair to attend the show for FREE with a friend, please email your full name to hipindetroit@gmail.com with the subject line #elvis. We will draw one lucky winner this Wednesday and will email them details on how to claim their prize. Don't forget, El Club is ALL AGES ALL THE TIME.